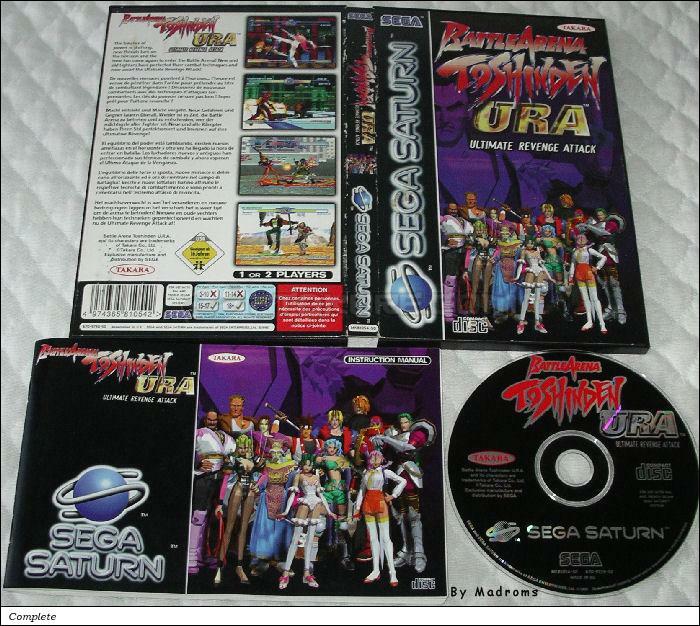 Toshinden URA is the second Toshinden to grace the Saturn, and this time it is not a poor port of the Playstation original (like Toshinden S/Remix) but an original title. Halfway at the very least, since it is based on Toshinden 2, but it features a few new characters, an all new plot, and it was personally converted to the Saturn hardware by Takara themselves. Running at high-resolution (704x448) with 30 frames per sec animation, it sounds like a real treat, right? Well think again. On the technical side: the game does not look good at all. Only the bitmap backgrounds and lifebars run in high resolution, the 3d arena ground and the characters are rendered only with double horizontal resolution - 704x224. In plain english, you have characters looking only slightly better then in Toshinden Remix, fighting in front of full high resolution backgrounds. Does not sound too shabby now, does it? But, I have to say that the characters are all detailed and well textured, so if it would not be for this "resolution problem", they could have looked very very good indeed. The backgrounds themselves seem to be the work of very advanced pixel art, some of them (like the arctic level) look beautiful, especially as they are running in high resolution. But most of them are quite uneventful, and again, dull. The only exception is the snow effect in Eijis stage, and the rising curtains in Dukes level, which gradually fill the stage with sunlight. The full 3d arenas of the Playstation game looked many times better. A big problem with the games looks is the fact that it only runs at 30 fps. The animations are not great at all, and look very jerky as well. This is a remnant from the Playstation original, which also had horrible animation, it seems they did not even attempt at fixing this. The special effects are, unfortunetaly, very low quality and have no transparencies either - except for one, huge fireball which uses meshes. You can apply meshes to the rest of the special effects via a secret option menu, but in all honestly, it does not make them look much better. Well it could be worse - just look at Toshinden S/Remix. Gameplay wise, the game mostly matches Toshinden 2. Compared to the first Toshinden game, you got new dash-in moves, a taunt, an Overdrive meter with its associated special move (activated by pressing all 4 attacks simultaneously when the gauge is full), and many changes in the character designs. Characters also gained a lot of new moves, and some older ones now act different. It is fortunate that URA controls much better then S/Remix did. Nowhere near the silk-smooth controls of Virtua Fighter or Dead or Alive, but better regardless. Compared to Toshinden 2, the cast is a bit different - Gaia and Chaos got replaced by Ripper and RonRon, Ripper being a violent fighter with hand blades, and Ronron being a nerdy teacher using giant bombs. Vermillion and Sho returns as secret bosses, while the regular bosses are now Replicant and Wolf (you have to fight Replicant multiple times). Also, Ellis lost her skirt, possibly because they could not recreate it without horrific looking meshed transparencies. The best part of the game is, again, the music. Toshinden 2 and by extension URA as well, had much more synthetic sound, but the melodies are still nice and variated enough. The new characters all got their own new theme songs, composed by the original sound producer (Yasuhiro Nakano) and they sound as fantastic as the rest of the tunes. Interestingly, Tracy uses the theme song of Chaos, I wonder how that mixup came to be. Sho's theme, again, stands out from the rest in its sheer awesomeness, it starts with an excerpt from Bachs Toccata like before, but then changes into a hyper-fast electronic beat with a wild guitar solo. The ending song is much similar to this, but more organic and less electronic - and even more hyper. The FMV intro is also incredibly good, but it does not use CD Audio - on a trivial note, it was also composed by another person, Kouji Hayama, famous for doing the music in the infamous Cho Aniki series. In a very stupid designers choice, the ingame tunes restart every round of fighting, so you may not hear more then 20 seconds of each tune (this IS the most annoying problem in the game, believe me), but you can just pop the disc into your CD player and enjoy the great music whereever you want. The game is very much worth buying for this alone, but if you only want the music you may as well buy Toshinden 2 for the Playstation, since the tunes are much shorter in URA (2 minutes average, versus the 3-4 minutes on the Playstation - Sho's theme even featured Saxophone in the original). The ending song is intact however - and so is Vermillions "silence" tune with chirping and hooting. So, when the game is just a sub-par fighter compared to all the other great choices on the Saturn, who can I recommend this game to? The gameplay is very unpolished but is purposefully newbie-friendly with one-button special moves (and an excessive ingame help on every menu, by pressing Z). The graphics could have been great but the game uses low resolution polygons, which makes the game lose all the great details it has. The animation is jerky, the special effects look horrible, and you can not fully enjoy the music unless you use the disc as a music cd. You can access hidden options with a code that adds a lot of interesting gameplay choices to mess around with - but the novelty of these soon passes. Furthermore you do not have individual character endings either.